If you read our article on Plextor's Xtreme firmware for the M5P (http://www.cdrlabs.com/Reviews/plextor- ... mware.html), we mentioned that there would be some changes to the hardware when the actual M5 Pro Xtreme shipped. Plextor has now released some more details. Sorry.. its in Japanese. - TSOP package has a maximum page size of 16KB vs 8KB with the BGA. This supposedly gives the drive better "buffer management"
Take note of the slight name change. Apparently they had to change it when switching to a new PCB. 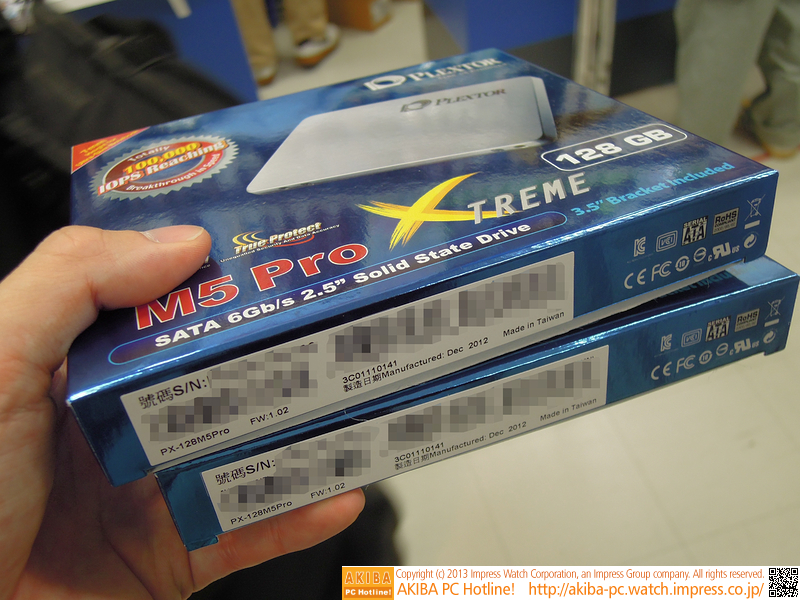 The M5Pro Xtreme is out in Japan. Slightly updated packaging advertising True Protect and the 100K IOPS. Take note of the changed specs on the back of the box. I still can't get over the fact that the write speeds are slower on the 128GB model. Maybe just more accurate? Model number is still "M5Pro" for the Xtreme.